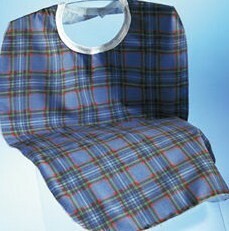 Washable or disposable bibs to protect the user and their clothing. Lightweight Bibs (as image above) are made from attractive stain resistant fabric and can withstand prolonged use without cracking or becoming uncomfortable to wear. The disposable bibs have two cellulose layers to absorb fluid and a plastic film to act as a barrier to protect clothing. They also have a front pocket to collect spills and integral back ties to secure in place.